Today, we are releasing two new reports, both available from our website. These are our first public reports built using the data gathered using our media monitor and you can probably expect more like these two in the future. 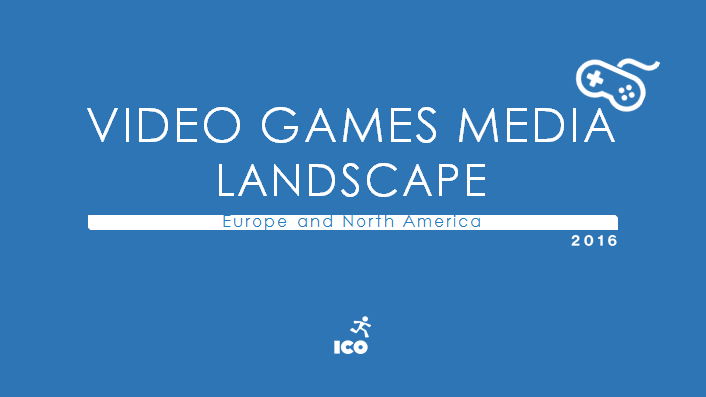 The first report, which is free (you can make a donation when you get it on Gumroad, if you do, we won’t mind), is a look at the overall landscape of those media that are dedicated to video games. 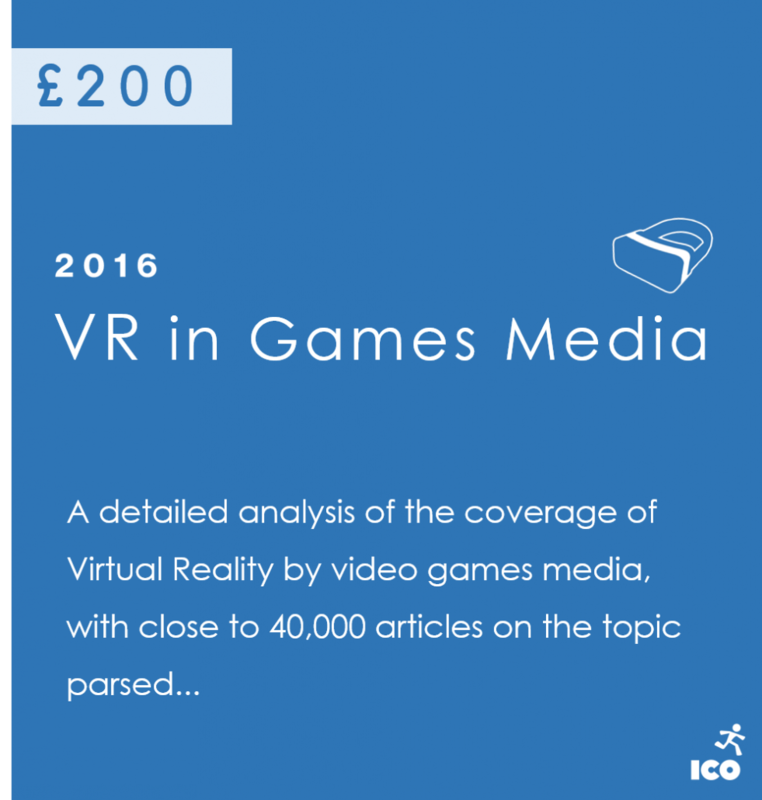 The second report, which is not free, is a deeper and more specific look at video games media and their coverage of VR, focusing on the key platforms (Oculus Rift, HTC Vive and PlayStation VR), the mist VR-friendly media, and the key VR games that were covered. Rather than describing them, let me share some of the findings of the reports. 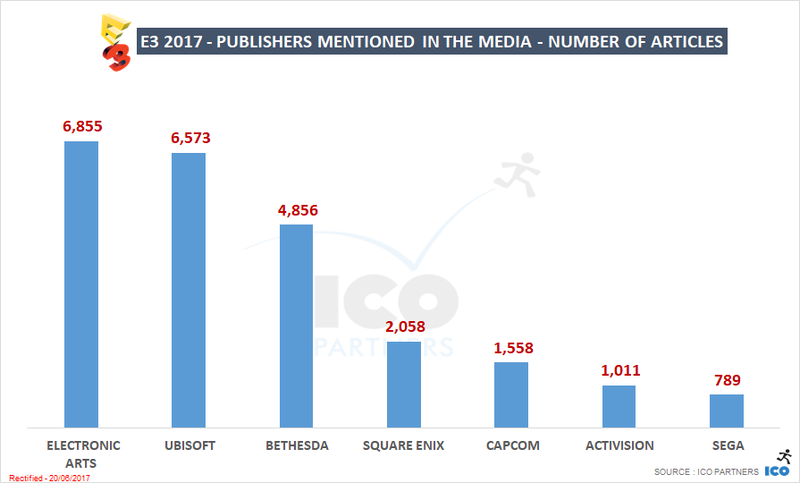 One of the things the report looks specifically at is the coverage received by the major gaming platforms over a year. 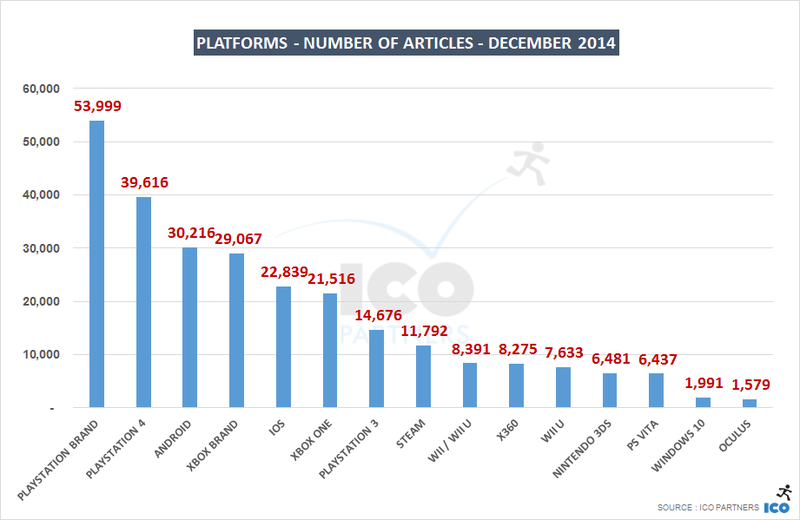 There are two things we considered when looking at the relative media presence of those platforms. First, the percentage of websites that mentioned the platform at all. 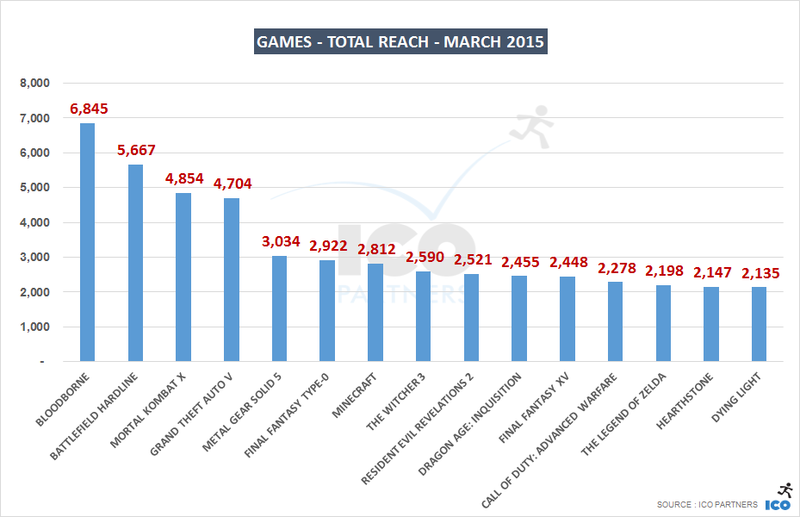 There are two very clear leaders, with both Xbox and PlayStation having 95+% of the games websites mentioning them. The main consoles are so ubiquitous that it is surprising that they aren’t at 100%, to be honest. But you have to account for PC-only media as well, and they are unlikely to have much coverage of the consoles. More surprising is how Steam, which is not a platform that has a very pro-active communication strategy, still has 90% of the websites mentioning it. 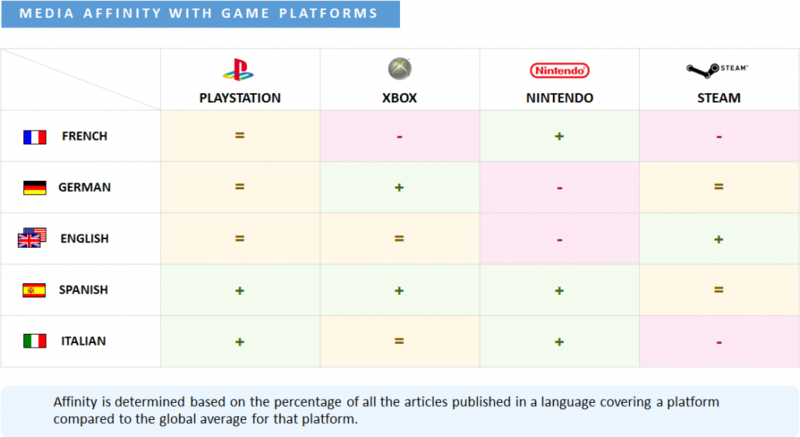 This is ahead of the Nintendo platforms (Wii, Wii U, 3DS) standing at 86%. If you are familiar to the blog, you won’t be surprised to see PlayStation ahead here. They have a very strong media presence, and they are constantly ahead of the other platforms in terms of media coverage. 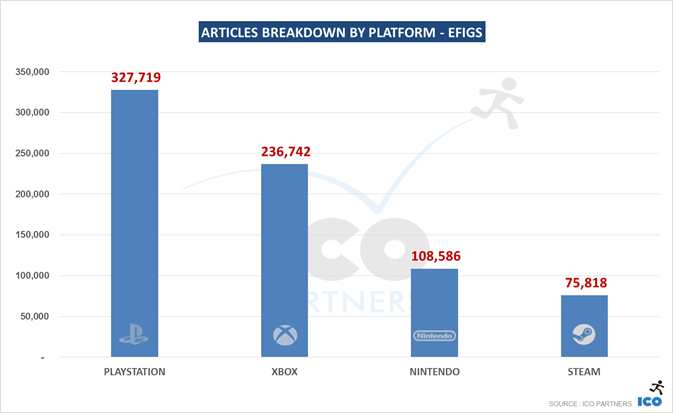 In terms of scale, that’s still 3 times the total number of articles mentioning the Nintendo brands, and almost 30% more than the volume of articles mentioning the Xbox brand. Steam being behind matches with what we were referring to earlier, and the lack of a concerted communication strategy on the platform from Valve. 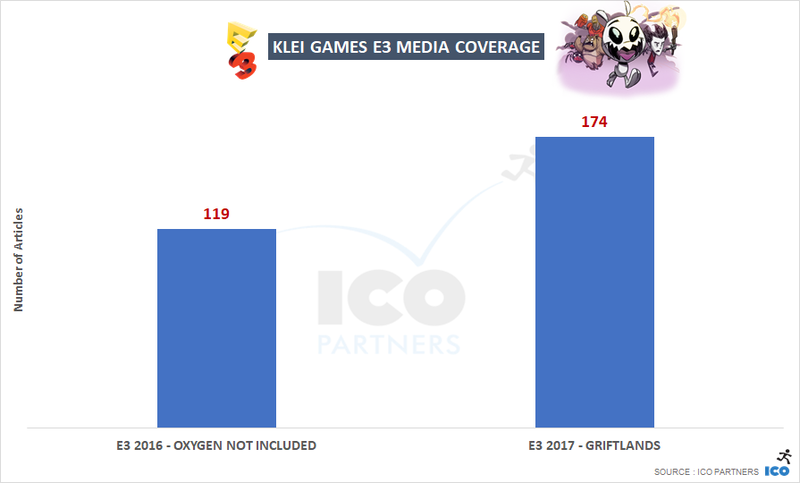 Much of the coverage is inherited from studios and publishers launching their game on the platform, and without consideration for the brand presence. One objective of the report is to provide some reference points in regards to how different the media from the different countries are a different from one another. 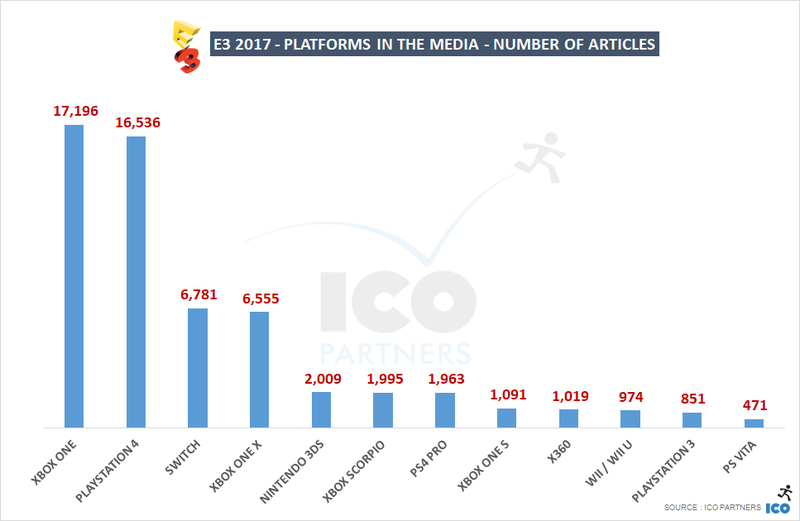 We are able to put together this table to show what we called the “media affinity” for certain platforms based on the language of a website. 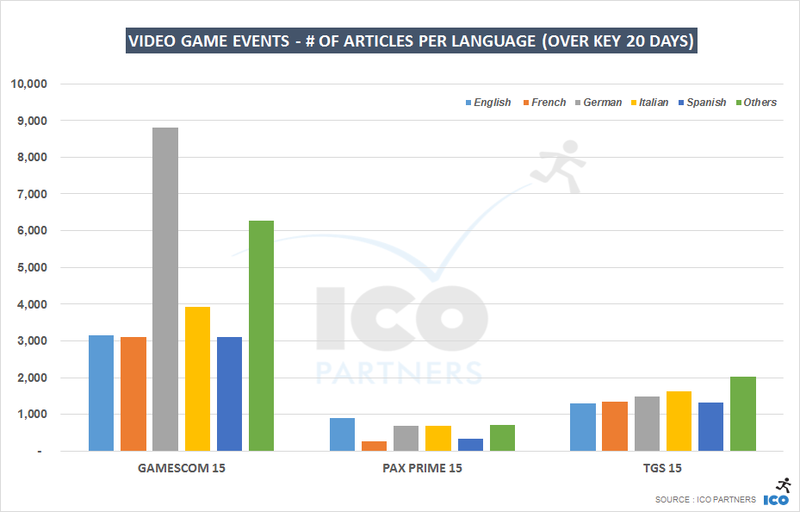 One very interesting pattern is how French, Spanish and Italian media, all based in Mediterranean countries, have a stronger affinity to Nintendo platforms compared to websites in German or English. 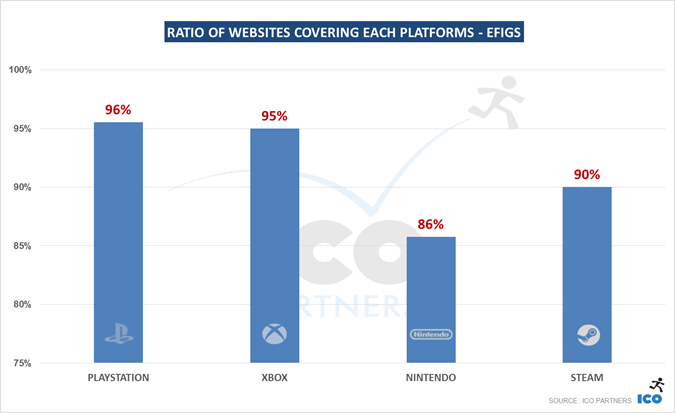 This is not to be interpreted, for instance, French websites having more coverage on the Nintendo consoles than on the Xbox ones. 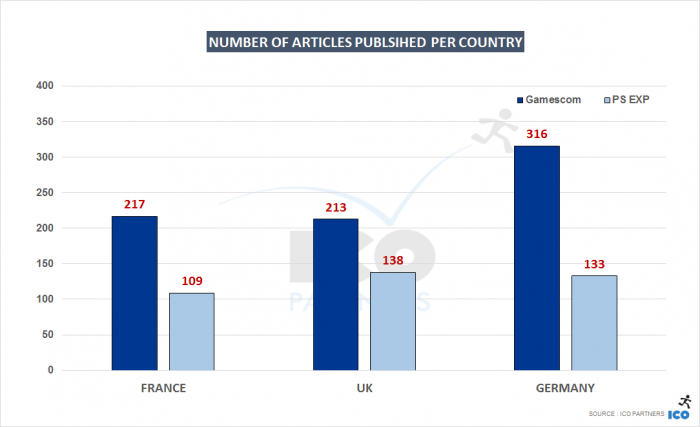 But in proportion, French media are writing more articles on Nintendo than the German media. I think this is an important consideration – as this helps understand the different sensibilities of the different cultures when it comes to games platforms. Here is another very telling example. 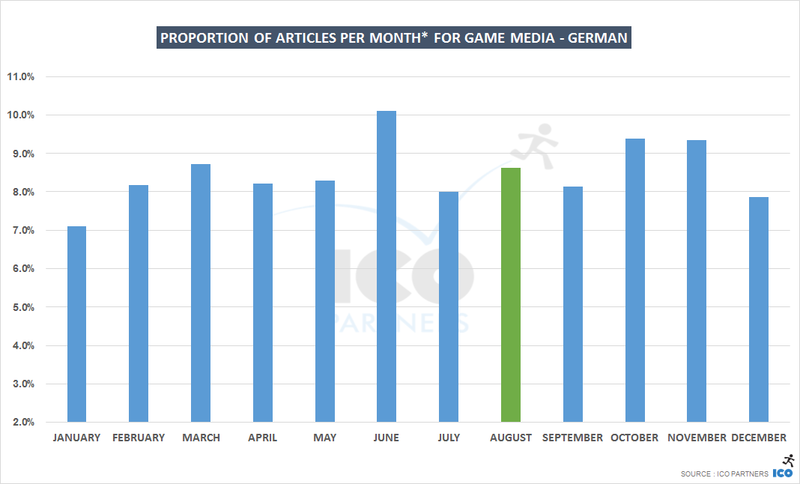 Below are the top 10 games in terms of media coverage in English and in German, for the calendar year 2015, set at the same scale. 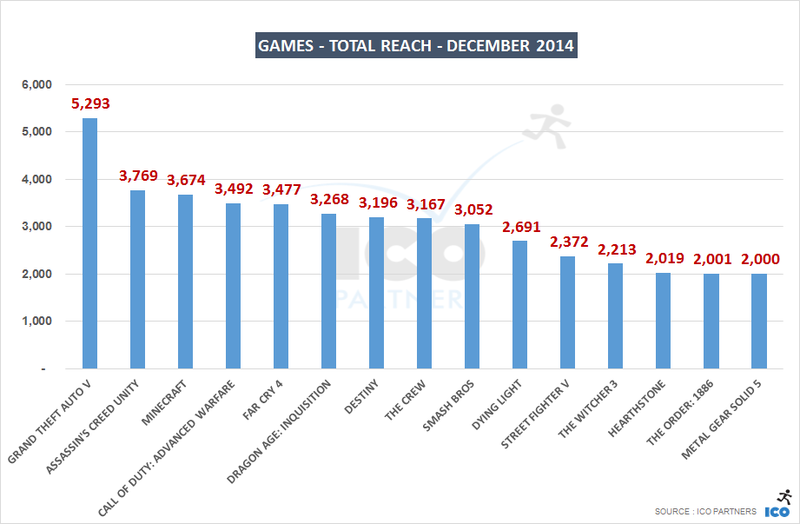 We discussed in the past how The Witcher 3 was the most mentioned game of 2015, across all the languages we track. But in English it only came second, behind Fallout 4. 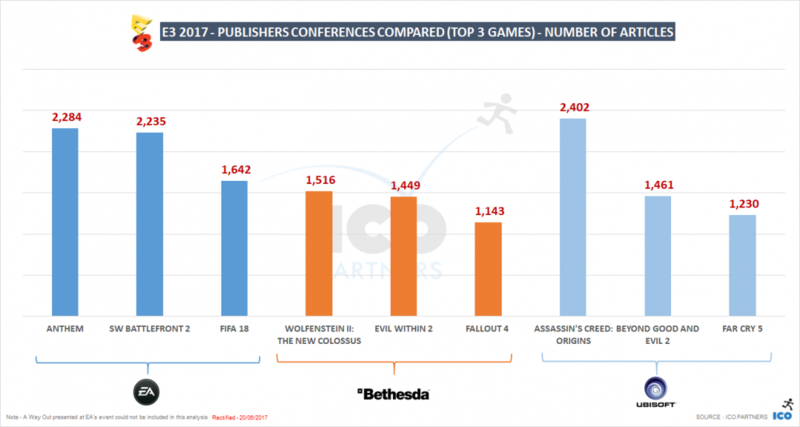 In German, The Witcher 3 is the clear winner with a third more coverage than the second best game… Star Wars Battlefront! Another interesting takeaway is the very strong media coverage in German for World of Warcraft. The game doesn’t make it to the top 10 in any other language. 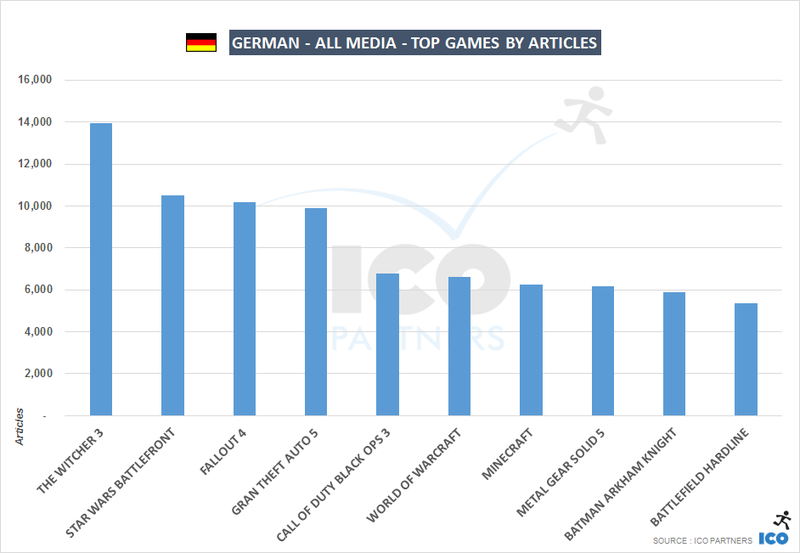 World of Warcraft had more articles in German than Metal Gear Solid 5 had in English. We made the landscape report free to anyone, you just need to enter your email and ask for a download link. We wanted this report to serve as a foundation for other reports we are writing, and making it free allows us to use it as a reference points across different things we are building. 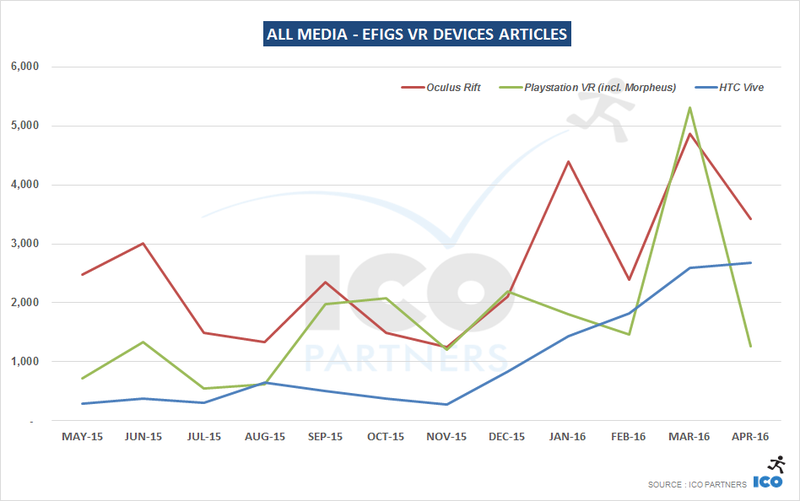 Our second report is more in-depth, is not free, and is looking into the media coverage of one of this year’s strongest trends, Virtual Reality. 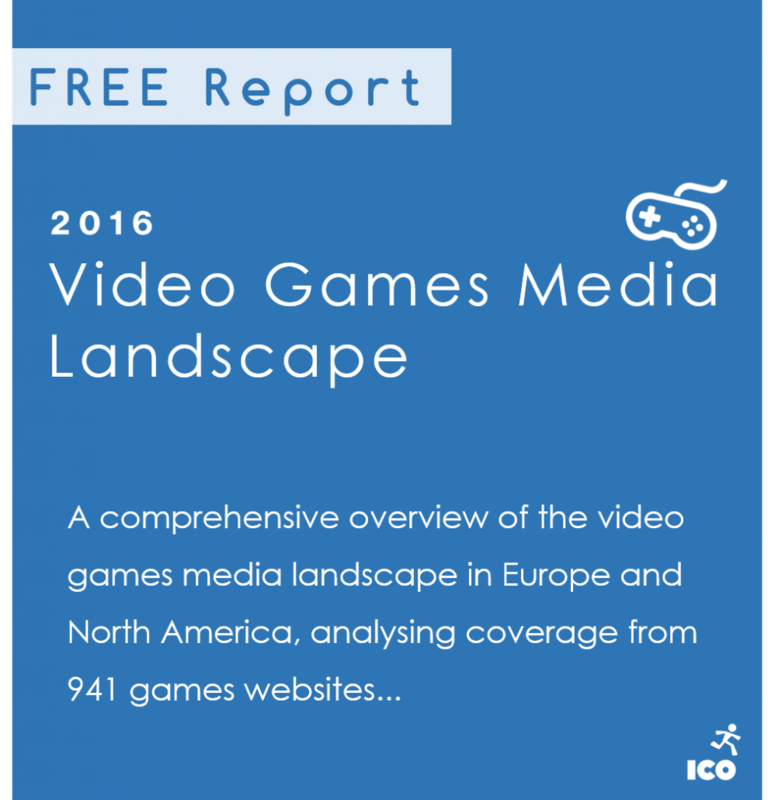 This report is also covering a full 12 months of coverage, from May 2015 to April 2016. 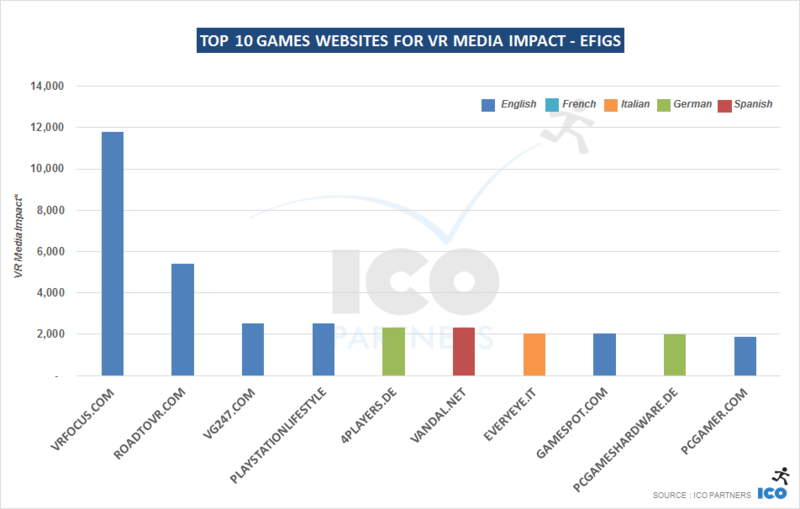 One of our findings was done by looking at the ratio of websites that covered VR in some way, compared to the ones that didn’t cover the topic at all. 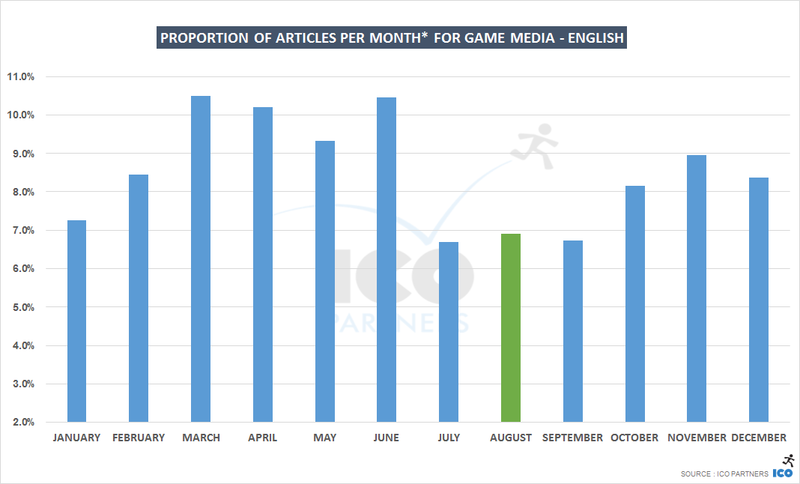 100% of the English websites we track mentioned VR in a way or another during the 12 months period. It is very unusual to have such a perfect score, especially considering the tool has it own flaws, and it would tend more towards missing mentions rather than finding false positives. VR as a topic for video games English media is there and is very strong. 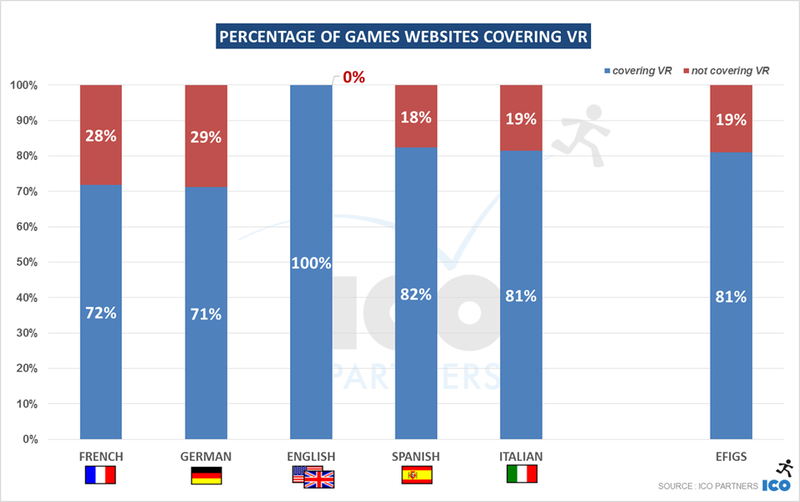 More than 25% of both French and German media didn’t cover VR in any way during the period. That’s significantly behind the average observed, especially considering the very generous criteria we used there. Looking at the volume of content shows another different trend. 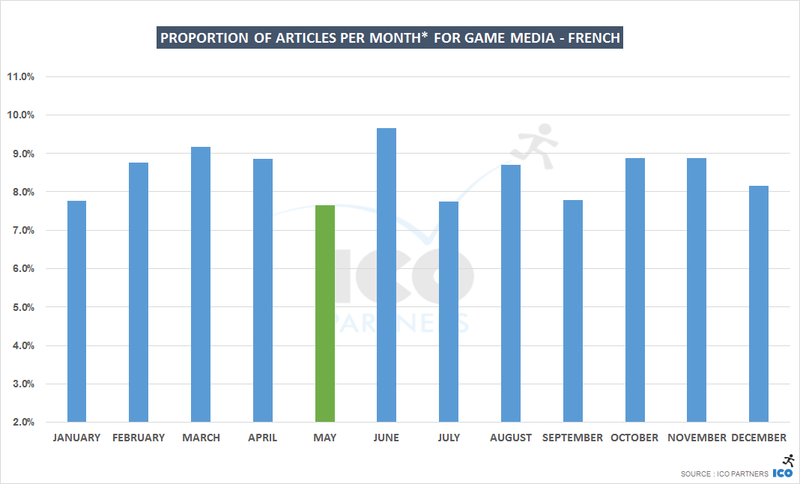 VR as a topic is incredibly weak among the French video games media. They saw fewer articles than in any other languages. 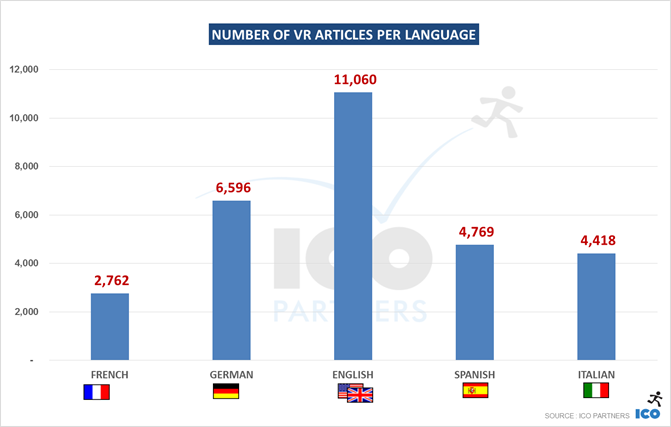 While the percentage of German media covering media is the lowest, the ones that did cover VR wrote more than 6,000 articles referring to it. 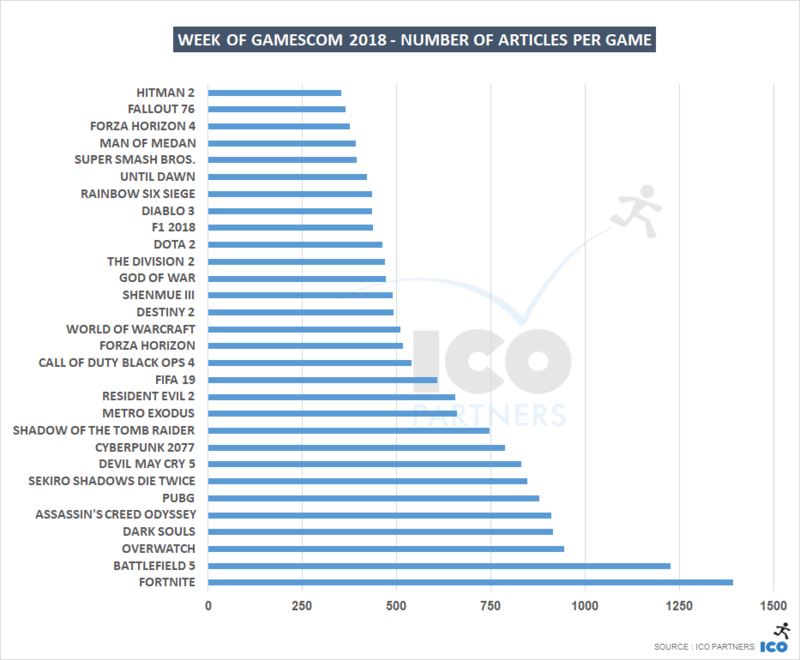 This is still a lot lower than the total number of games articles in English and highlights the fact that, at the moment, VR as a topic for video games media is a higher priority for English media than for the others studied. 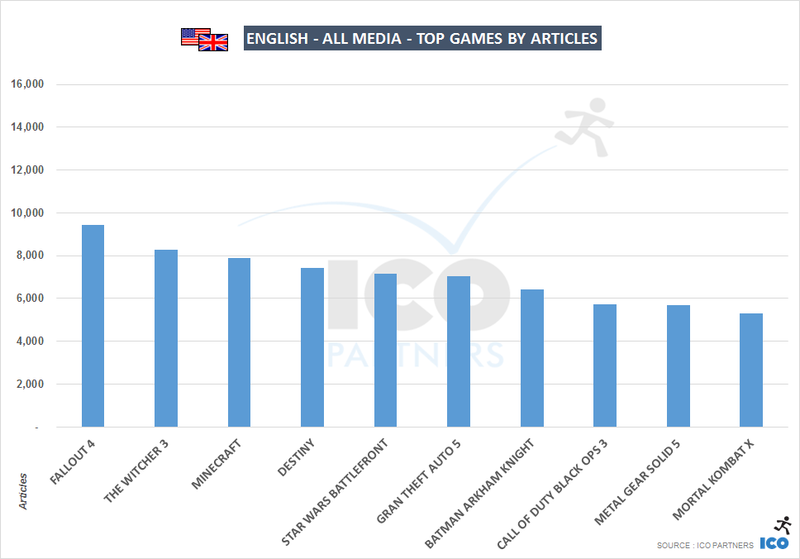 There is a clear majority of English websites (and lack of French media), but tellingly, the top 2 media are dedicated to VR. For them to appear here is not only based on the fact they have written a lot on the topic, but also speaks to the fact that they managed to build an audience and have a strong enough following. The report has more detailed ranking for each language if you are involved in the VR scene and would like to see more. Lastly, I wanted to show how the coverage for the key 3 VR HMDs (Head Mounted Devices) has evolved over those 12 months. 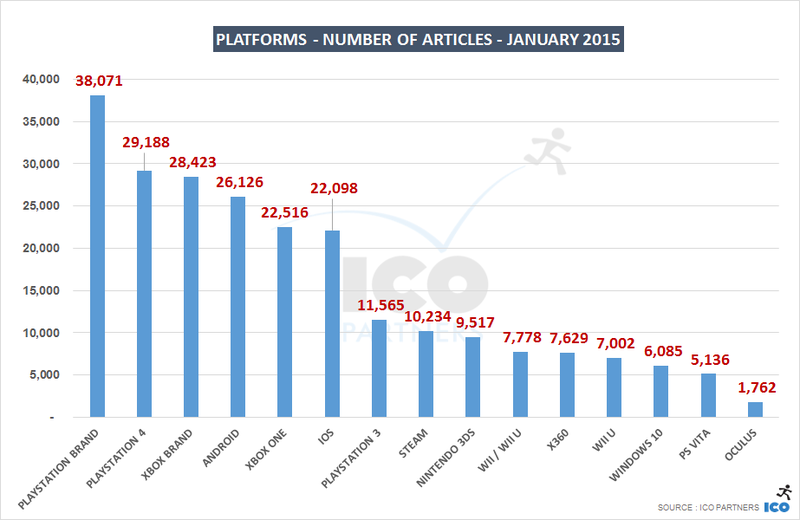 All 3 platforms are trending towards more coverage overall. However, while Oculus is leading the way most months, it is slowly losing its lead. Playstation VR secured more coverage in March 2016, where it announced its release date and pricing, showing promise for when it releases towards the end of the year. It is also very interesting to note the slow but steady growth of the HTC Vive media coverage. 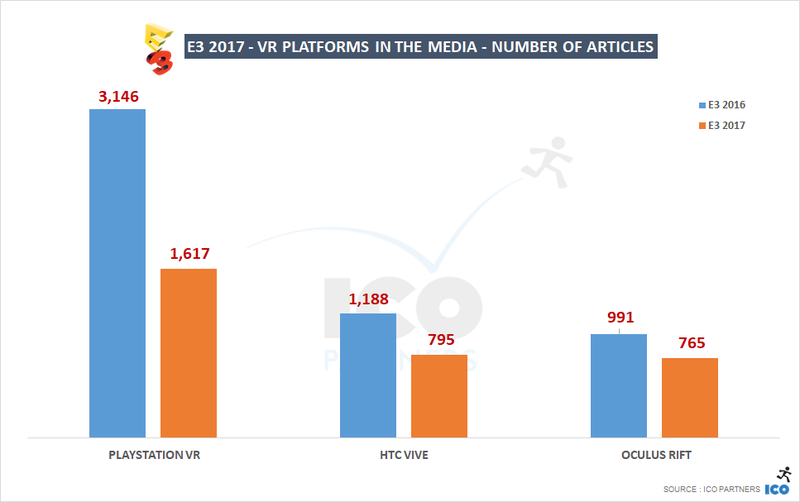 The lead in brand awareness that Oculus built over the years probably helped in getting good coverage for the important announcement, but the HTC Vive is now catching up to it, with the media at least. 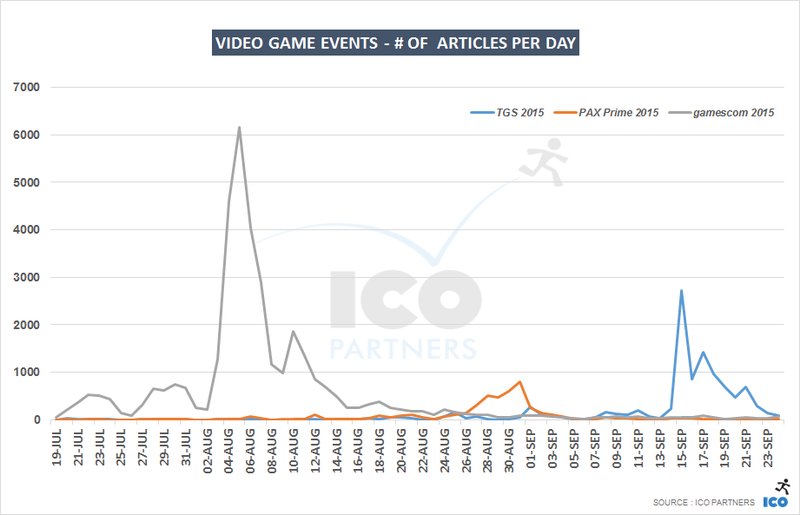 While I had some requests to look into the Tokyo Game Show the way we looked into gamescom or E3, I thought that with the event being at a different scale (on this side of the world, the tool doesn’t track very well coverage from Asian media and they are just excluded from the data on these posts) it could be the opportunity to look at the coverage of different game events instead of an in-depth look at just TGS. 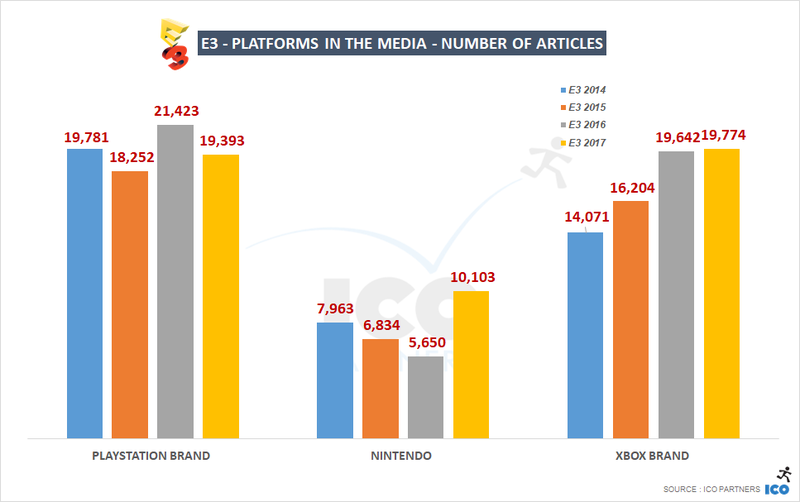 The usual disclaimers from the articles on the media monitor apply, but on top of this, I need to remind everyone that we can’t currently properly track E3 specifically in the media coverage (hence the slightly different methodology applied in the E3 coverage article). When looking at the way events are covered in the media, there was an interesting pattern on the timing of the coverage. There is some media attention as the event is getting closer and the hype is ramping up. You have rumours of the reveals you can expect, announcements about what to expect on site, this sort of things. Events also happen with very different timing in terms of the week of the day they happen. Business events will take place during the work week, consumer events will usually continue during the weekend. Then, you have such a density of information being thrown at the audience that you also see a good amount of coverage happening the week following the events when some interviews that couldn’t be put formatted properly during the event itself, or some change encounter that could only probably followed up on afterwards, can finally be published. To cover all those aspects, and looking at patterns of media coverage across different events, I decided on a formula that seemed to apply fairly for all events. Taking on the first day of the event, I take the media coverage of the 9 days preceding the event, and the 11 days from the day the event start. I called them the Key 20 days, for lack of a better terminology. As you will see, I also consider the media coverage on a daily basis, but this formula gives me a component to compare the events with each other. This year’s Tokyo Game Show had a Sony press conference ahead of the show. And comparing the media coverage of this year with the coverage of last year, there is a very interesting effect that immediately noticeable. 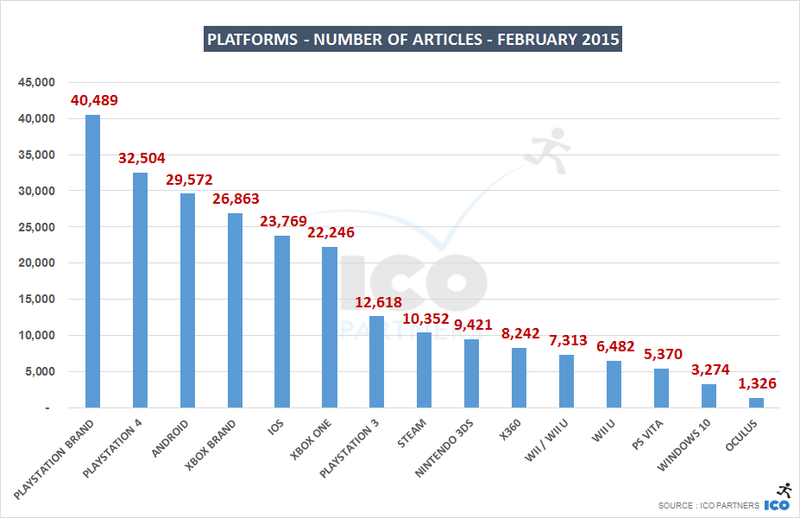 The total amount of media coverage is not massively different from last year. 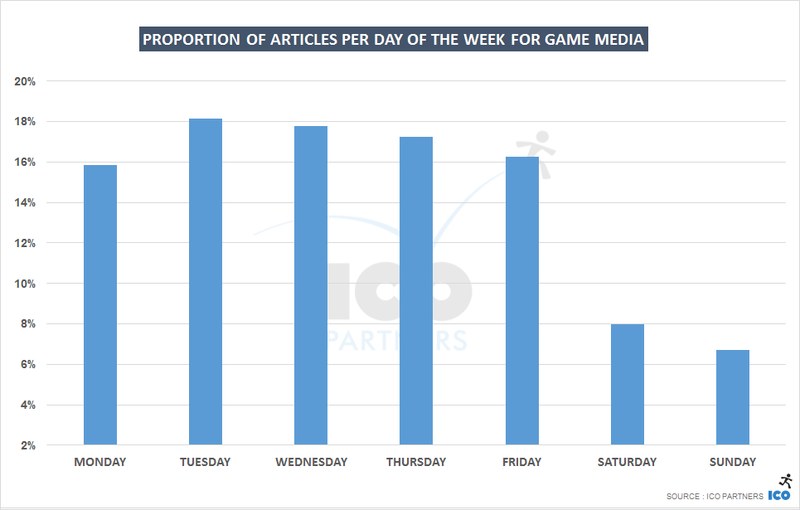 But a lot of the media coverage shifted to a few days earlier, coinciding with the Sony conference. 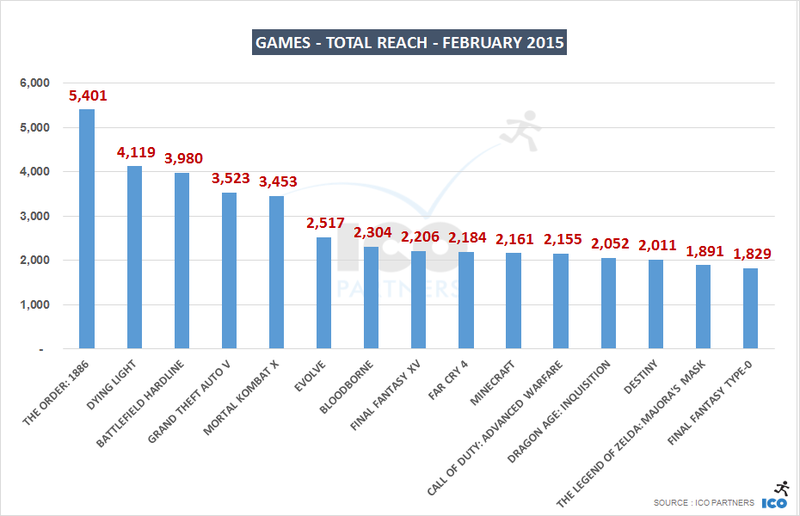 It seems that the Sony conference had no effect but to displace when the media coverage happened. To be fair, over the key 20 days, there has been a marginal growth year-on-year, but nothing incredibly significant. The Sony conference has just shifted when the media coverage is happening and there wasn’t an impact on the volume of coverage. 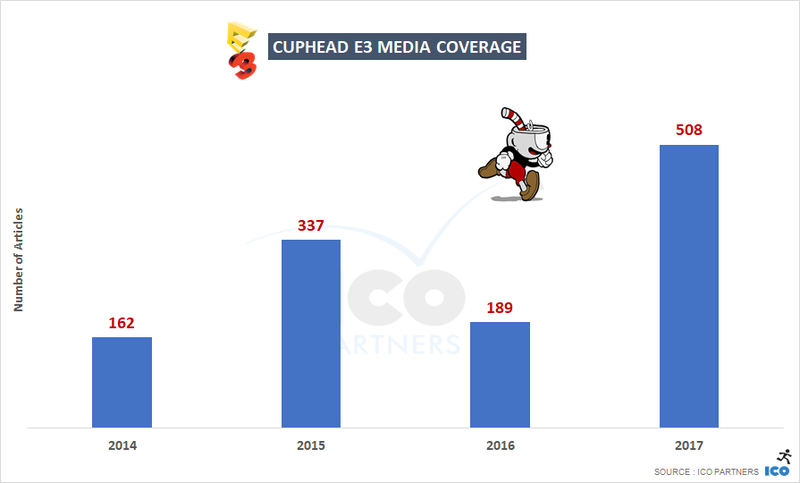 The general coverage of the event decreased, and the Sony conference is hiding that decrease of media coverage. I would tend to align with the second option, if only because the Sony Conference happened at a much more convenient time (during the work week). 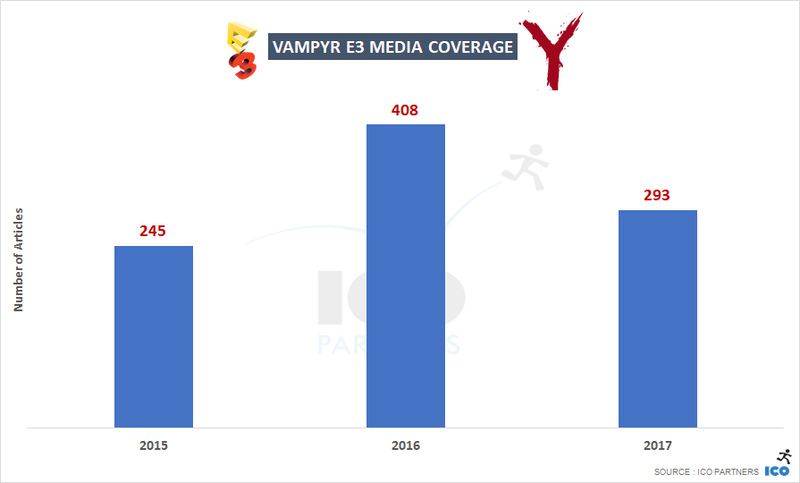 Of course, it shifted a lot of the Sony specific media coverage earlier, but I would have expected to see a more significant growth due to the more friendly timing. This hidden decrease could possibly be related to a weaker lineup of titles at the show this year compared to 2014. This is just a theory though – at the end of the day TGS this year still had more media presence and any growth is a good sign for them. 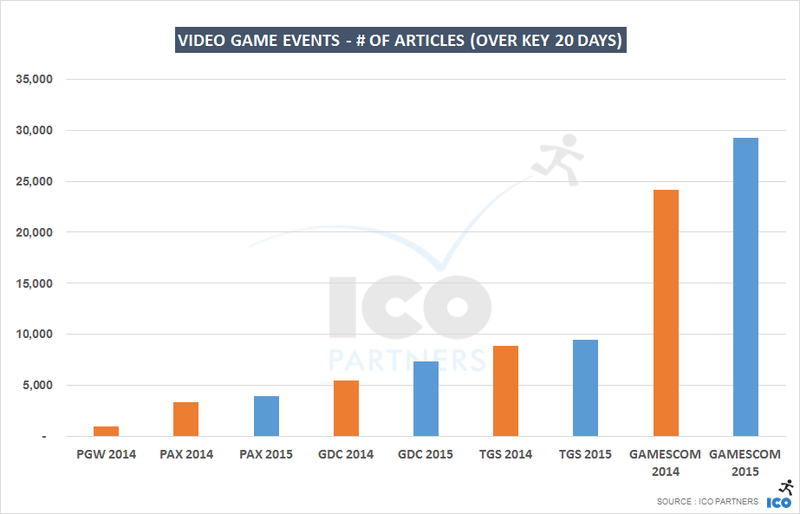 Events around video games seems to be multiplying every year, be they business events or consumer events. More and more local events are organised, conferences multiply as the industry diversifies. In a marketing budget, events can represent very significant investments And not just because of the actual cash cost, but also in terms of the human resources that need to be allocated for it, and the disruption they can have on the development of games in order to have playable builds for them. Getting a sense of the ROI for events is incredibly difficult – and while media coverage is one element to look at, it is definitely not the only measure to take into account. Still, this is the tool I have at my disposal, and one that can provide some interesting frame for references. To clarify this graph, both PAXes in there are the PAX Prime event in Seattle, the largest of the PAX event. PGW is the Paris Games week and I didn’t put the 2015 numbers because the event hasn’t happened yet (it’s at the end of October). I will post the 2015 numbers on Twitter and might do a follow up of this article on it. The reason the PGW was included, despite being a pretty “small” event from a media coverage point of view is because Sony will do an international press conference ahead of the event. It was presented as the replacement for its gamescom conference that didn’t happen this year (leaving Microsoft alone to take the lead on the event media coverage). What is very revealing with this graph, is the difference in the magnitude of each event for media coverage. 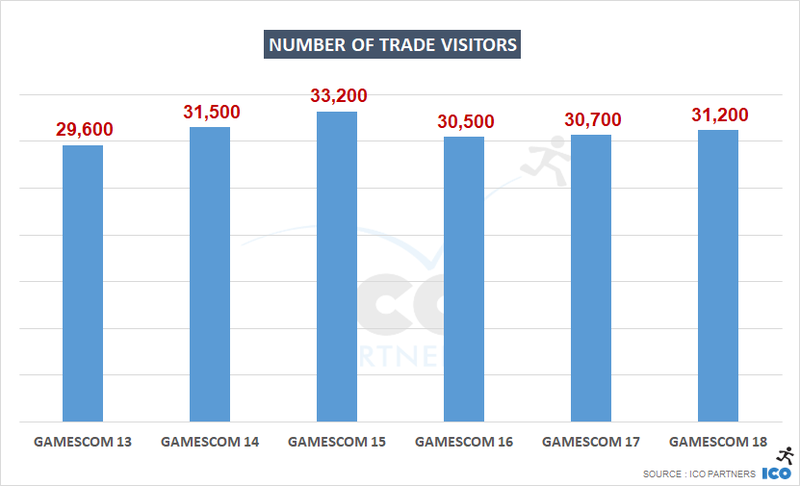 Keeping in mind that the tools we use don’t properly cover Asian media, the TGS is a significantly smaller event compared to gamescom, and it makes sense in that regard. What is more impressive is the difference in scale between those 2 events and PAX Prime. PAX Prime is a consumer first event, but it saw more and more announcements being made there the years. Cliff Bleszinsky’s upcoming LawBreakers used that event for its first reveal for instance (and to great effect IMHO). There is an impressive discrepancy in the media impact between the premiere shows, with established brands (and strong support from the largest actors) and the rest. While I expected a big difference, this is bigger than I would have expected. 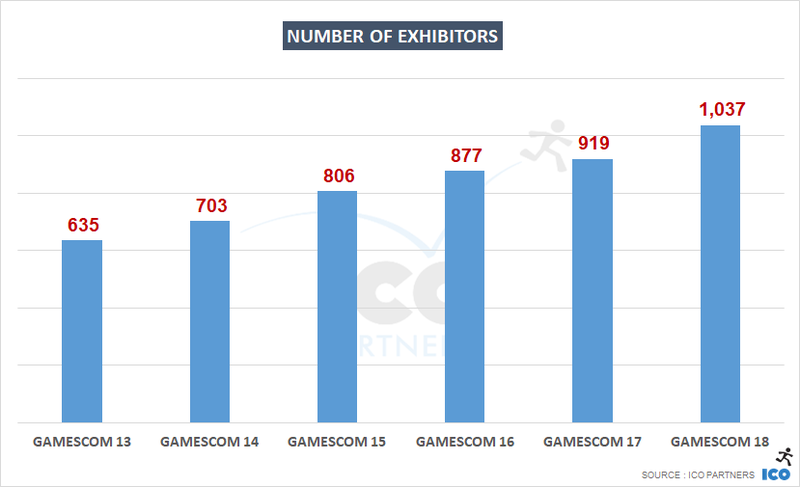 If E3 was in the graph, it would dwarf gamescom, and everything else would look even more ridiculously smaller. If anything, I feel this shows there is probably too much concentration at the moment in terms of the media coverage of events. 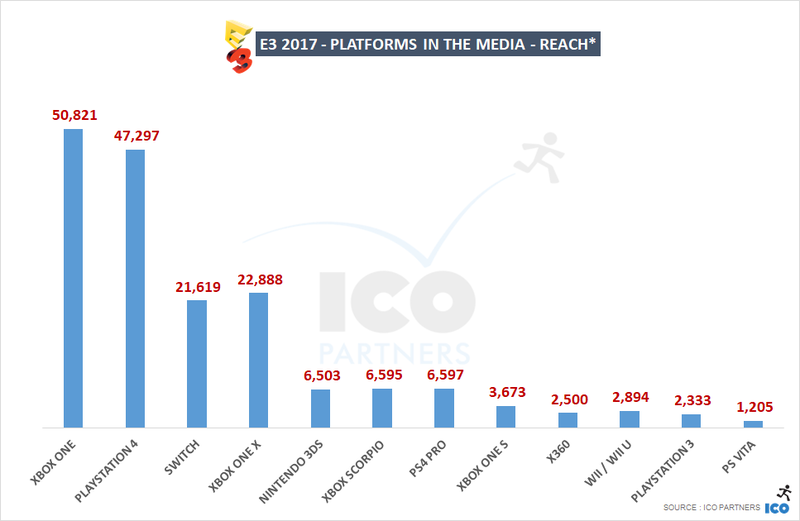 It will be incredibly interesting to see if the PGW can show the impact of the Sony conference move for the event coverage – it could prove that spreading the communication across more events is a worthy strategy, the way they brilliantly orchestrated the Playstation Experience last year. With gamescom, PAX and TGS within 2 months of the summer, I thought I could show how they get covered in that period. It is important to remember that gamescom was unusually early this year. It will be back to the 2nd of August next year, and closer to PAX Prime again. In the graph, the fact that PAX Prime runs over a weekend is quite apparent. Where gamescom and TGS both peak around the large conferences and the first days, PAX main day is on the Monday (and the last day of the event). The first graph is looking at the total number if articles in each languages. The second graph at the number of unique websites in each languages. 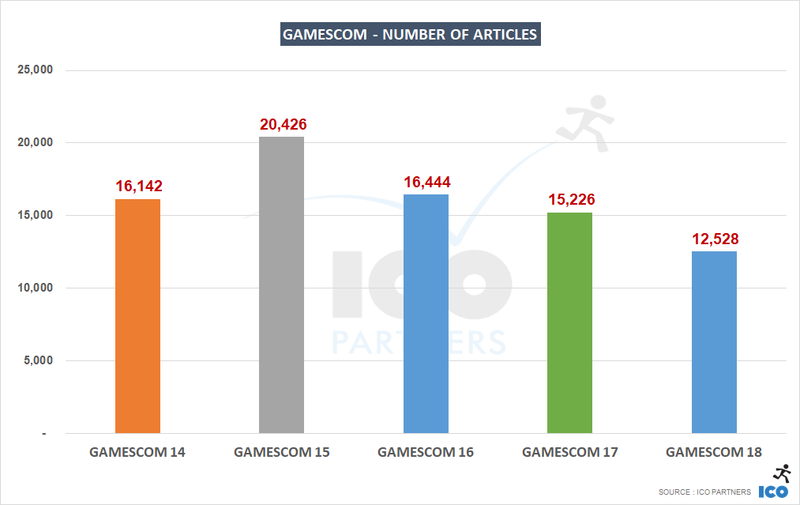 For all languages, both in volume of articles and number of unique media, the gamescom is the largest event. It is a lot larger for Germany though, unsurprisingly as the event is hosted there, and a lot more local media is likely to pick up on related news. It is interesting to note though, that there are more English media covering PAX Prime and the TGS (again, PAX being in the US, they benefit from the locality), but more articles are written in English about TGS. It shows they are just more news announced there (which is also logical considering the events profiles). 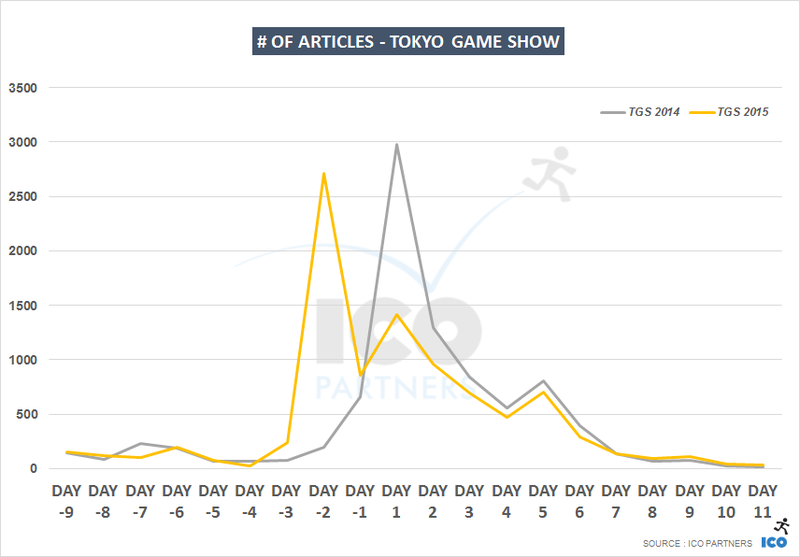 However, the fact that about the same number of German media are covering PAX as TGS is more unexpected. 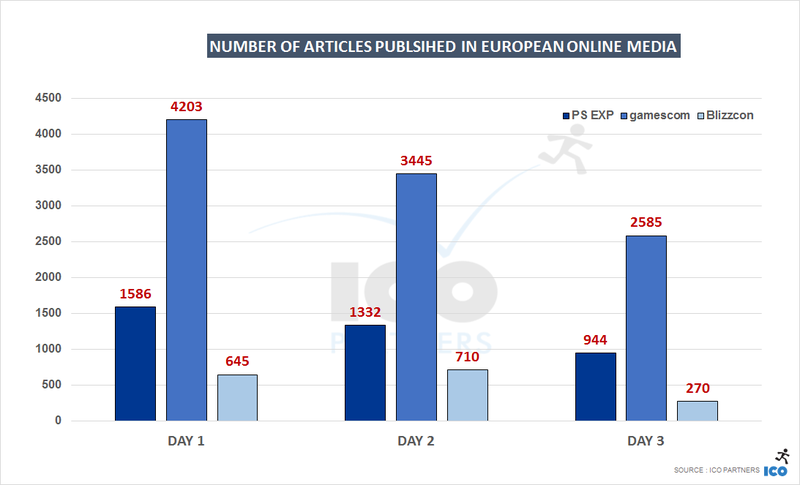 I suspect the stronger PC profile of German media makes a larger proportion of outlets interested in PAX news, than say French media (about half of the number of websites covering TGS covered PAX). 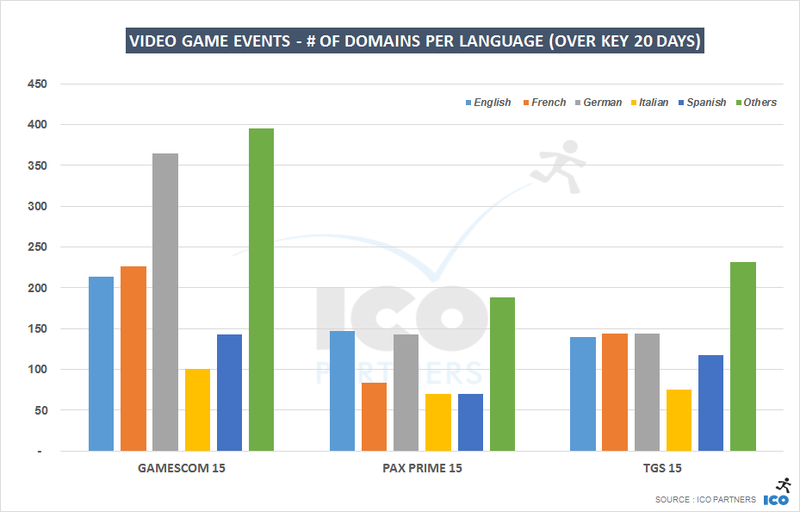 Looking at number of articles in French for the TGS compared to PAX Prime also shows a strong interest in the Japanese event compared to the other languages (and France love history with the Japanese culture could be at play here). Large events are very unique beasts, they concentrate a lot of the communication happening in the game industry. 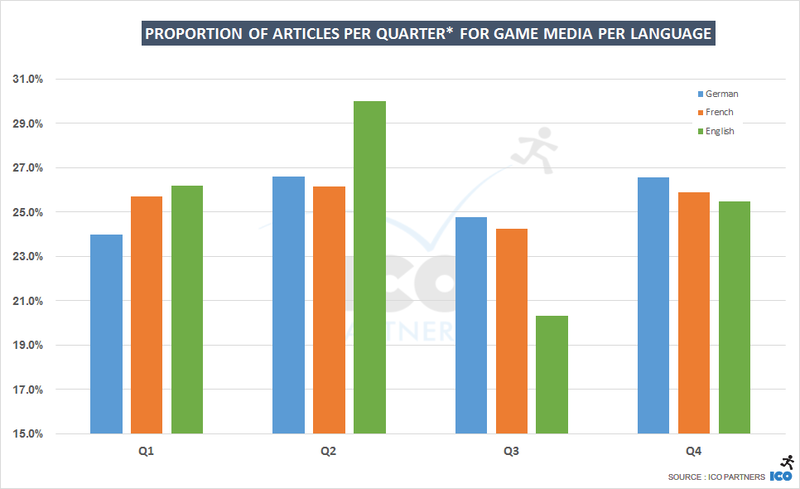 But looking at the data for the smaller events, it is clear they are growing in terms of their media coverage too. They can play a very interesting role for companies that cannot compete with the large budgets the big shows are commanding. 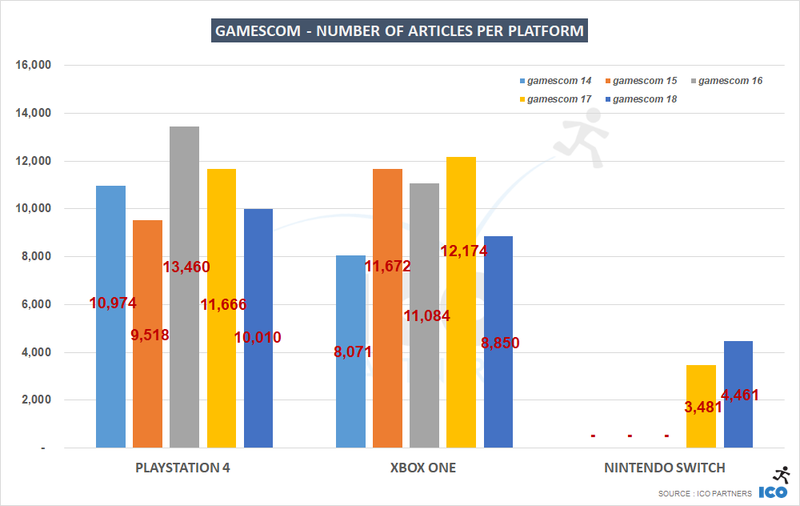 I will keep a close eye on those data and likely do a follow up, with a focus on events outside of the “blockbusters” of each continent (E3, gamescom, TGS). 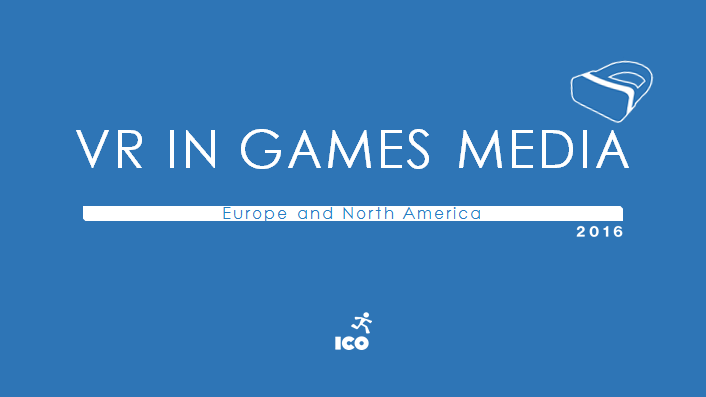 In a couple of weeks, Thomas Reisenegger from the ICO PR team will giving a talk at GDC Europe titled Everyone Can Do PR: How Small Studios Get Themselves Heard. The talk is an evolution from the one he gave in Vienna in January, with some format changes to help the audience better understand the key takeaways. However, one topic we have been discussing is how to add was some metrics to accompany the presentation. While there is a lot of common sense behind most of Thomas’ advice, we thought that adding some hard data was a good way to sway an audience perhaps unfamiliar with the day-to-day workings of PR but with a strong scientific predisposition (game developers, basically). A lot of this will read as obvious to some, but now we have the data to back up these common assumptions on timing of communications. I went into the media monitor tool, and ran some numbers. 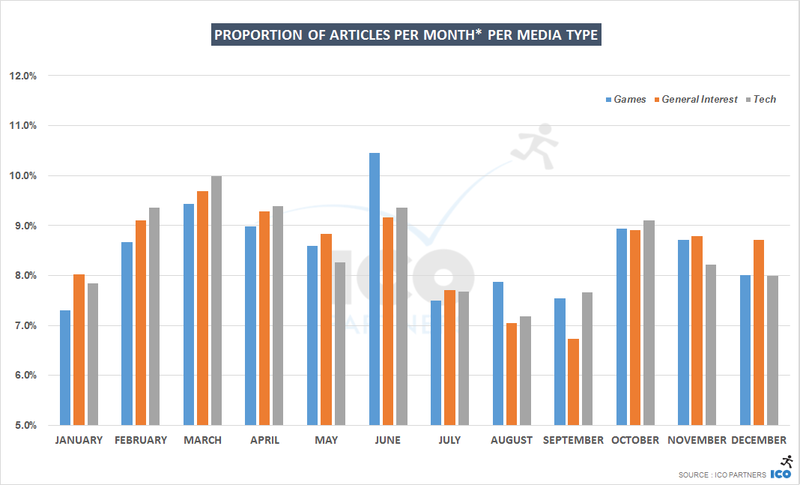 All the data below is based on one year of media tracking (from the July 1 2014 to June 30 2015), and it is based on the number of articles published by the websites we monitor. The idea is to look at what are the hotspots for the media, when they publish and when they don’t and take it into account in your PR strategy. Journalists tend to work mostly during week days, from 9 to 5. Making an announcement during the weekend makes it less likely to be picked up. In the same spirit, publishing late on Friday will likely push your news to the other side of the weekend, or possibly cause it to miss the news cycle altogether. 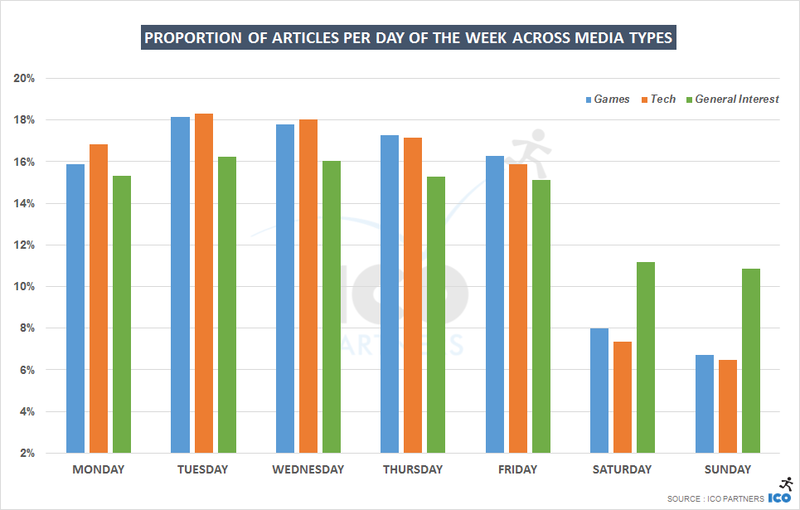 Beyond Saturday and Sunday, Monday is the 3rd slowest day in terms of volume of publications. As people come back from the weekend, it may take a while to go through events from the weekend and get back on the rhythm. Monday as a “slow” day is true across the board. 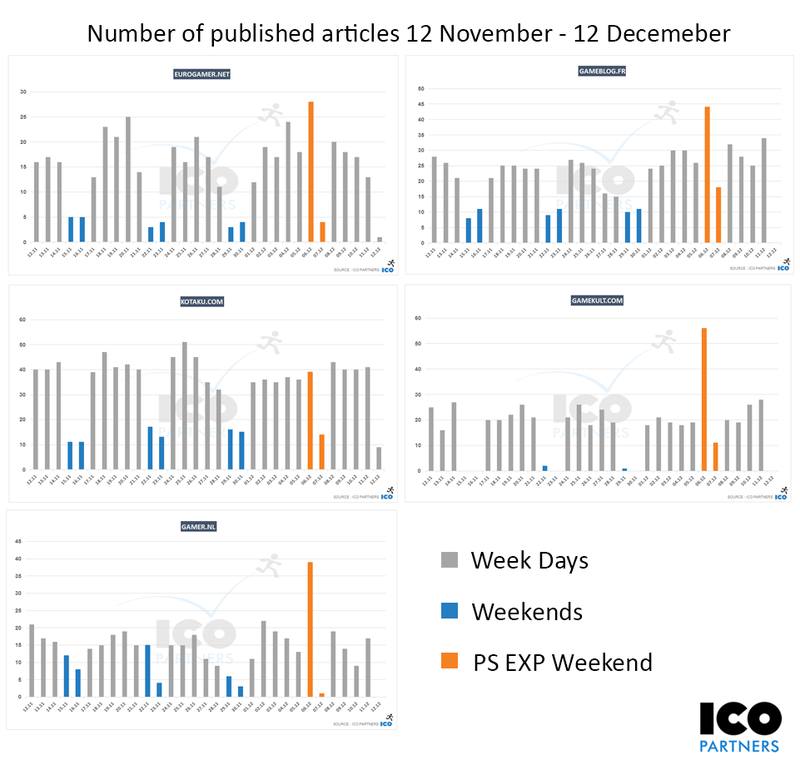 General Media (newspapers, magazine outlets) tend to have more activity over the weekend, as could be expected from a media type that covers news on a 24/7 basis. The concentration of media publications during the work week is actually more pronounced in the English language outlets than the French and the German ones. If anything, French websites are the most likely of the language groups to publish over the weekend (not what I would have expected). 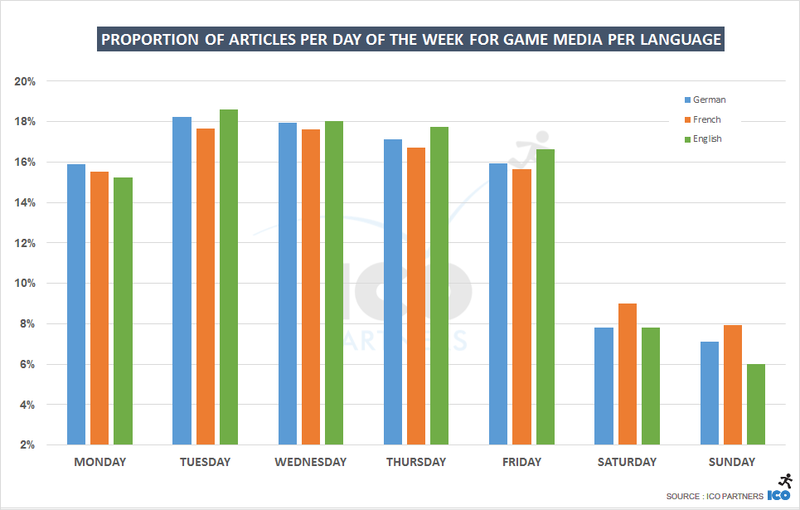 I have talked in the past about the volume of media coverage at certain time of the year, but that was mostly in the context of specific games. 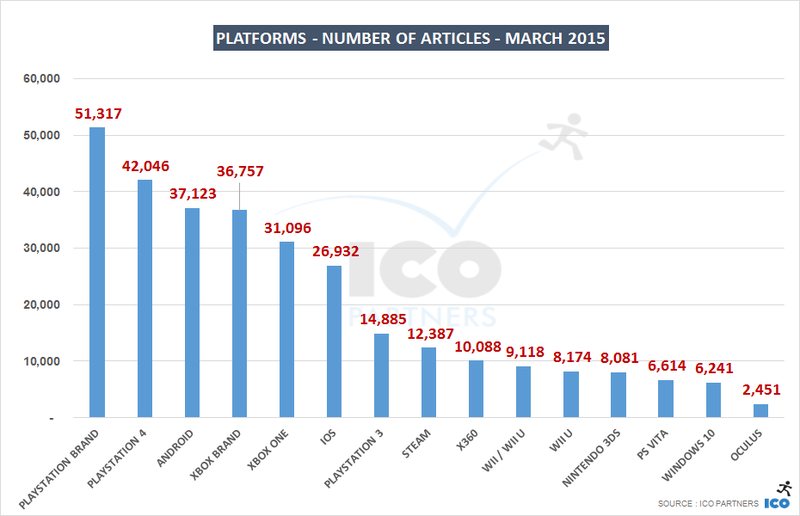 This is the opportunity to look at overall volume of articles, month-on-month. 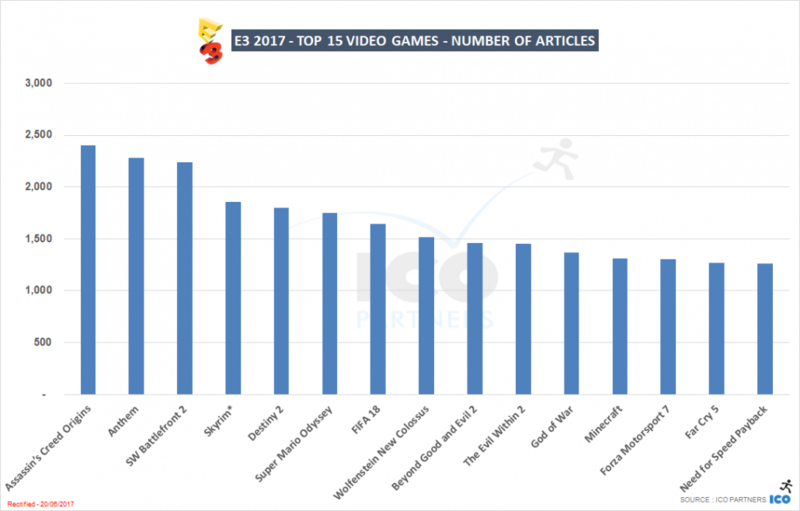 Clearly standing out is the month of June, thanks to the great media coverage of E3, it is the one month during the year that sees the most output from game-related outlets. 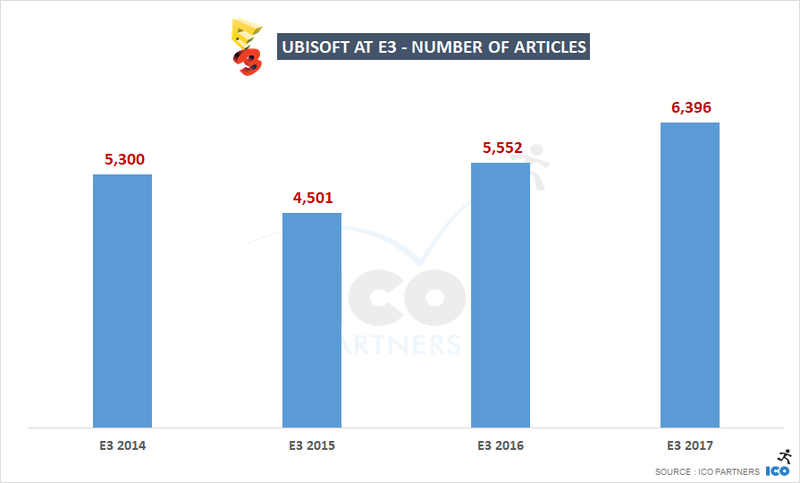 Getting media attention during E3 is difficult, but that’s also true for the week before and the week after. March is also a busy month. 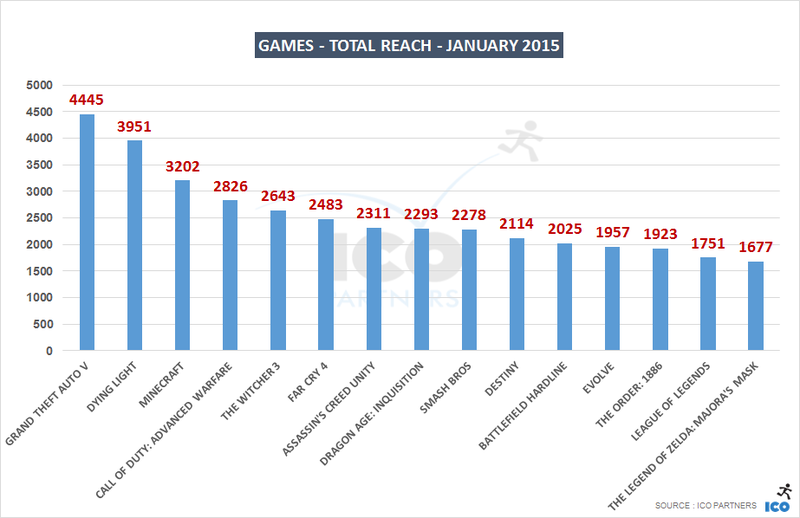 As the last month in the financial year for many companies, it sees a number important games releases. GDC San Francisco is also probably contributing in the extra media coverage. 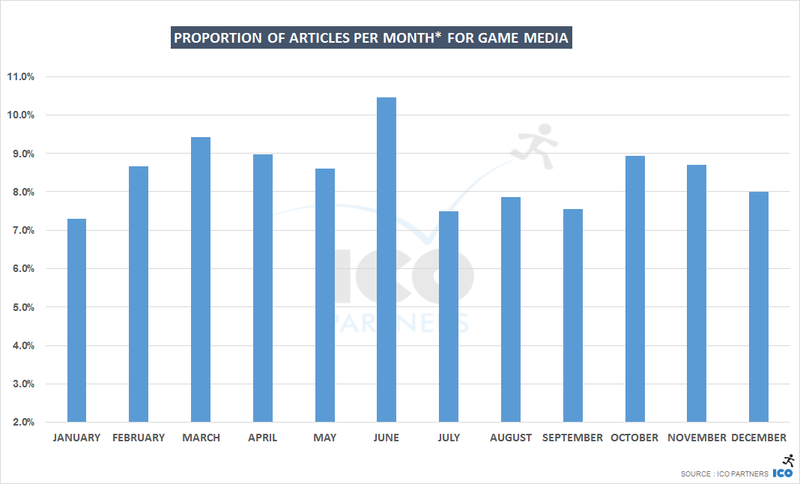 January is a slow month, and probably the time of the year where it is a bit easier to pitch a game to the media that may be a struggle otherwise. 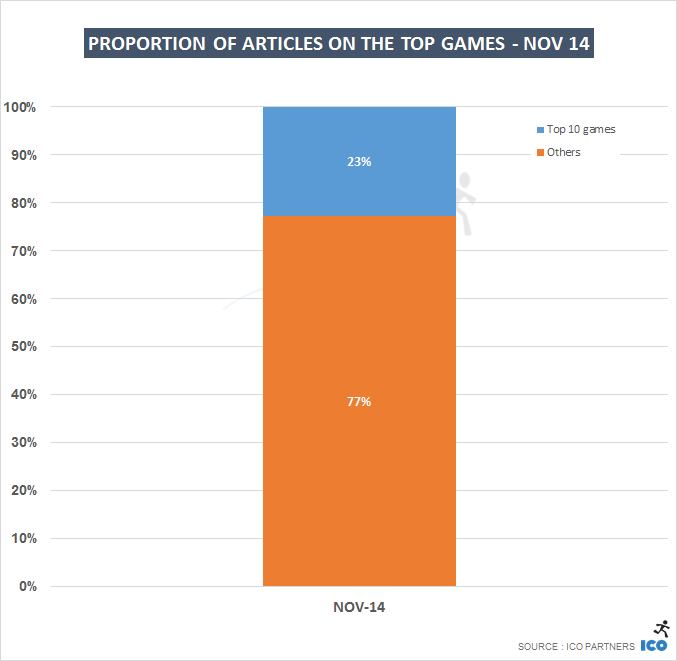 I might do a follow-up purely to discuss October/November, but suffice to say, that while it sees a lot of media coverage, it is highly concentrated on a few AAA games. May in France is a slow month. There are a lot of bank holidays, and many people take a few extra holidays to maximise their time off. The German media output is very steady. Steadier than any other languages. The summer months are not incredibly lower than the others. 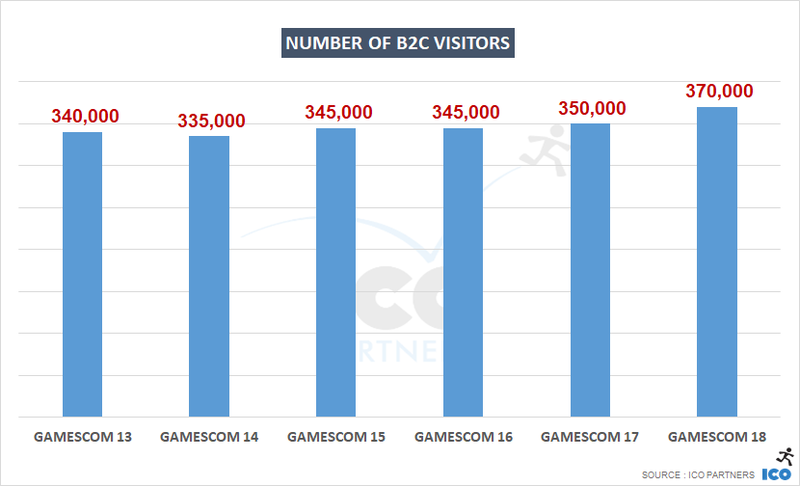 And it is worth noting that gamescom, being a local event, is probably having a significant impact on the August numbers. 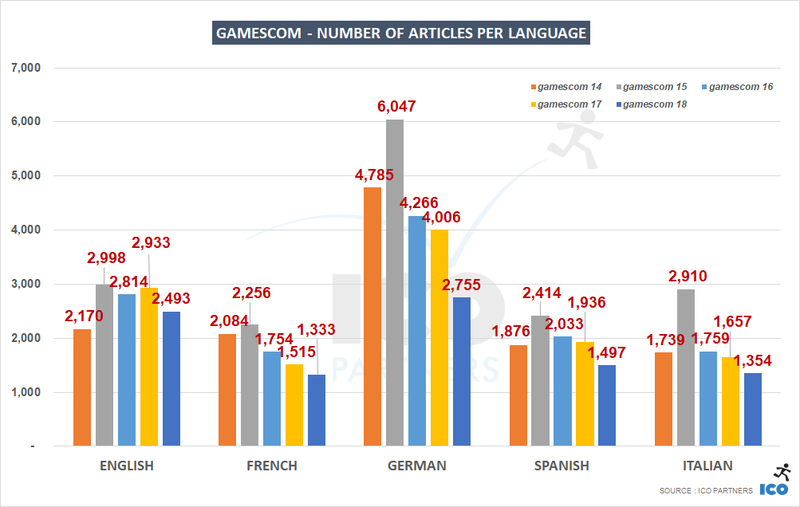 At the other end of the spectrum, English-language media has a significant drop in the summer, bigger than the one seen across all languages, and gamescom only helps a bit. 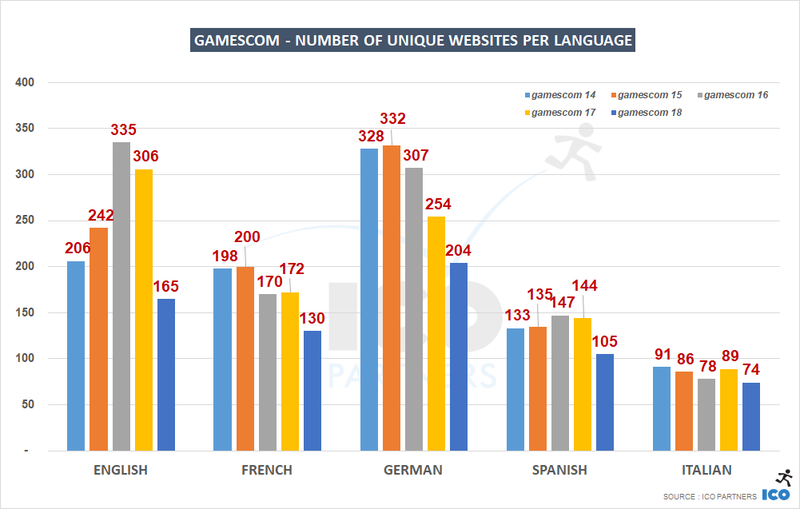 It shows the relative importance of E3 and gamescom for the 3 different languages. Don’t announce over the weekend or late on Fridays. Avoid making key announcements in October or November; around E3 in June; and you probably want to stay away from the summer holidays too. Do go to Thomas’ talk if you are at GDC Europe.